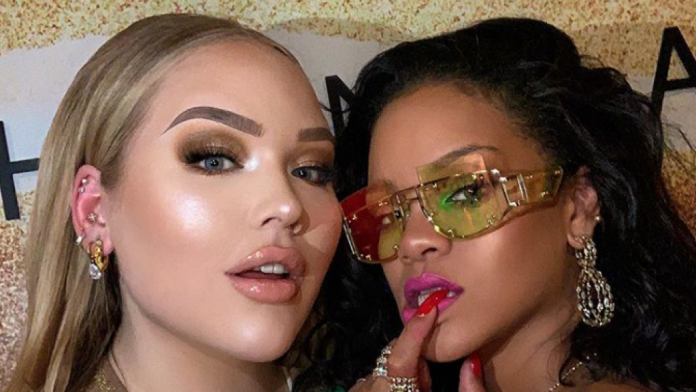 In her latest video, Nikkie de Jager, better known as NikkieTutorials, tells her eleven million YouTube followers about her meeting with Rihanna. Or as Nikkie calls her: The Queen. “I met Rihanna … But how did it go? And how did it come to that,” writes the YouTube star accompanying the video, in which she tells every secret about the special encounter. While the makeup enthusiast opens a book about the special day, she gives her own twist to the iconic makeup look of RiRi in the video clip of Who’s That Chick. The story all starts with Priscilla Ono, the makeup artist of the singer. The talented lady had previously appeared on Nikkie’s channel, and since then the two have always kept in touch. Through her, the sober Nikkie received an invitation to the party of the year in the heart of London. Completely made up with fake eyelashes and a good dose of highlighter, Nikkie boarded the plane towards Big Ben. Only a select group is invited, including plus size model Ashley Graham, who only appeared in a video with Nikkie. The YouTube says that the moment Rihanna came in, she could no longer hide her enthusiasm. When the Barbadian calls her name, she can only make a deep bow. “It was all it was appropriate to do for the queen,” Nikkie jokes in her video. And apparently RiRi was also impressed by Nikkie, because the new best friends were doing shots all night. sing karaoke, an evening not to be forgotten!